Cast on 118 stitches and work 1" in a K1, P1 rib. After band is formed, begin working the following pattern refering to Chart 1 (cable) and Chart 2 (leaves). Since the charts cover different numbers of rows, it is important to keep track of each section independently. 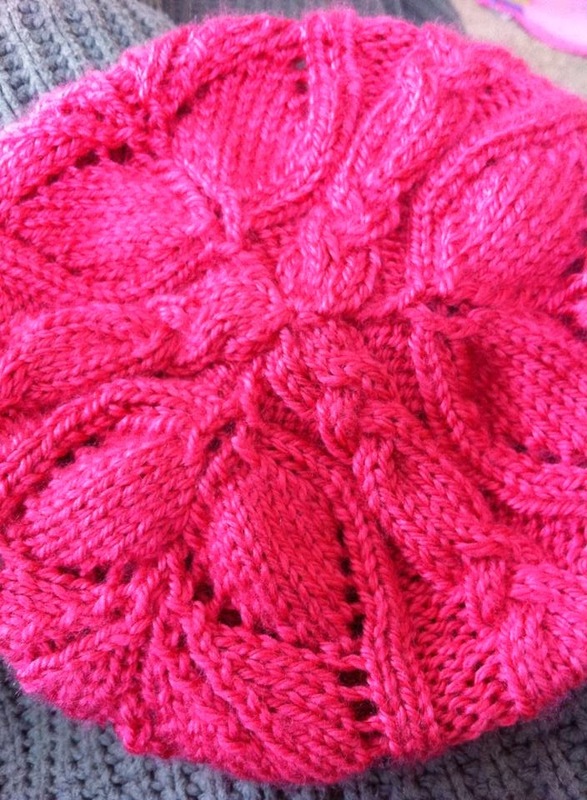 Work the charts in pattern until the hat reaches approximately 9" - you will have completed the leaves chart 5 times. Decrease Row 1 - continue to work the cable chart as previous. In each section where the leaves chart is worked K2, K2tog, K7, SSK, P, K2tog, K7, SSK, K2. 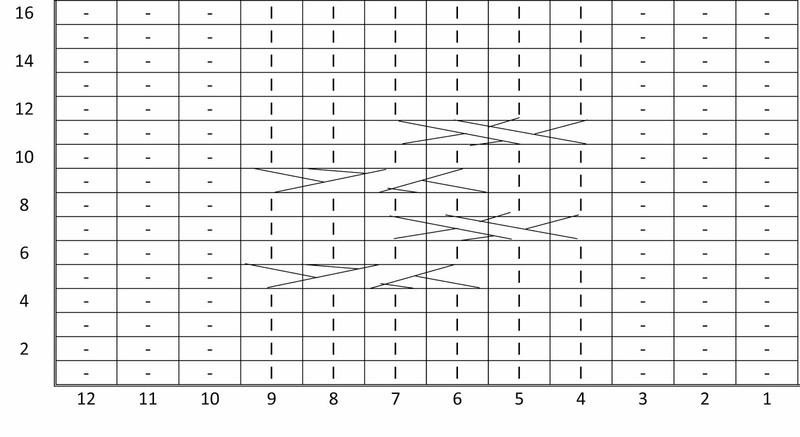 Decrease Row 2 - while working cable chart; in leaves section, K2, K2tog, K5, SSK, P, K2Tog, K5, SSK, K2. Decrease Row 3 - while working cable chart; in leaves section, K2, K2Tog, K3, SSK, P, K2Tog, K3, SSK, K2. Decrease Row 4 - while working cable chart; in leaves section, K2, K2Tog, K, SSK, P, K2Tog, K, SSK, K2. Decrease Row 5 - while working cable chart; in leaves section K2, K3Tog, P, K3Tog, K2. Decrease Row 6 - while working cable chart; in leaves section K3Tog, P, K3Tog. 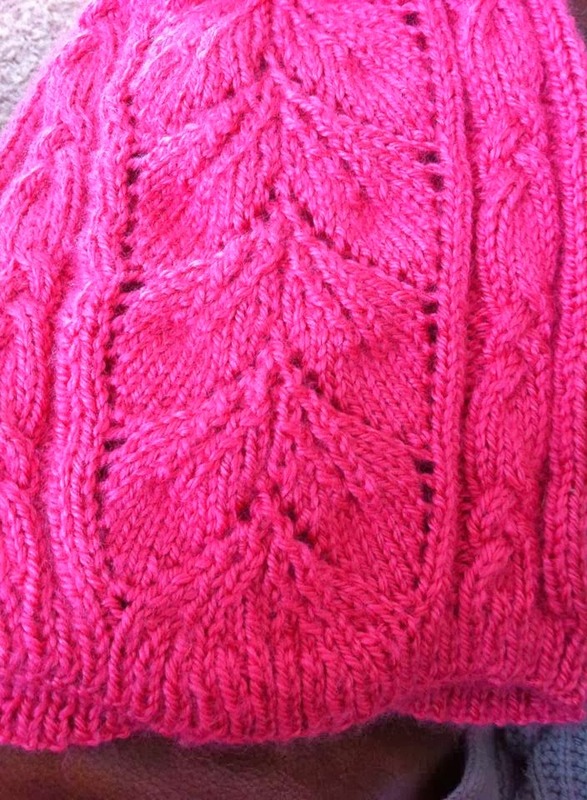 Decrease Row 7 - while working cable chart; in leaves section K3tog. Decrease Row 9 - with last stitch from previous row P3tog, work knit stitches as in cable chart, P3tog. Repeat twice more. Decrease Row 10 - P, K2Tog, K2, K2Tog. Repeat twice more. Decrease Row 11 - K2Tog. Repeat until last stitch. 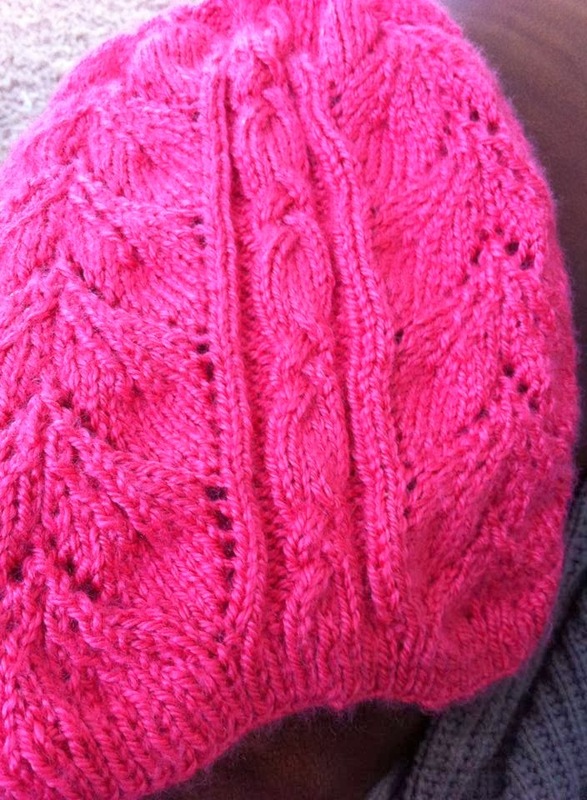 Sew through stitches and bind off to create top of the hat.